In the computer game the Sims 3, your Sims can get sick. They will not die from this, but they will manifest symptoms of the disease and worsen mood. The disease gives no bonuses except for the lack of having to go to work, but to see and to nurse the sick SIM is quite interesting. 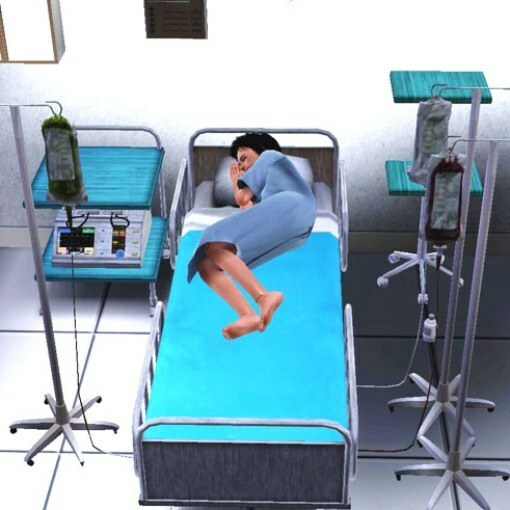 To get sick in Sims 3, send your SIM (character) in the hospital or arrange a job there. Then look for diagnosed patients and long time contact with them. After that within 2 days your SIM will appear signs of the disease. To stop and cure the disease, these 2 days do not let SIMA out of the house. If your SIM works – call for work and take a sick day. If you want the disease progressed, continue to go to work and walk down the street. SIM will not die, but after this he will be permanently released from work and school. Another way to get sick in Sims 3 is to walk in the rain or snow in light clothing. Send your SIM to walk through puddles or snow in shorts and t-shirt, then the result will not keep itself waiting. If you from time to time will display the character on such trips, the disease will last much longer. Some additions to the Sims 3 character can pick up seasick. For this take him out to sea on a pleasure boat or houseboat. Wait for the small waves of the sea, and your SIM will start vomiting. After a while, after pitching will stop the SIM for some time it will feel bad. To get allergies in the spring and summer send your SIM to collect flowers. After long contact with the flowers can he develop an Allergy. After the SIM ride out some time in the room, he'll be better, but again, worth it to pick up the Allergy reappears. To get food poisoning, look at the street food truck. Then make your SIM eat it two meals in a row. Then within 2 hours SIM will be sick and he will be poisoned. In addition, do not wash the dishes after meals, leaving dirty dishes and food scraps. Wait around will not infest insects. Do not call the exterminator and are constantly around them. Your SIM will soon be poisoned. In addition, during the game you can enter a cheat code and get the disease. To do this, simultaneously press Ctrl, Shift and C. In the opened window enter: MakeMeSick Tester - Give me a Cold, SIM caught a cold, Give me the Flue, to flu, Food Poisoning to poisoning.